Jay Thomas, MS, CRNA (2nd from left) provides a PANA Update to the first year students at the newly formed Cedar Crest Anesthesia Program. The student and faculty donations will offset months of RMH accommodations for families in need of support. January 22nd, 2019 students of the Crozer-Chester Medical Center/Villanova University School of Anesthesia celebrated Nurse Anesthesia Week (January 20 – 26, 2019) by reaching out to the community and preparing and serving dinners to family members and outpatients staying at the Ronald McDonald House located at 39th and Chestnut Streets. Derek Reckard, MSN, CRNA, PANA President interviews on PA Newsmakers about the importance of CRNAs in PA's Healthcare System - To view the video, click here! 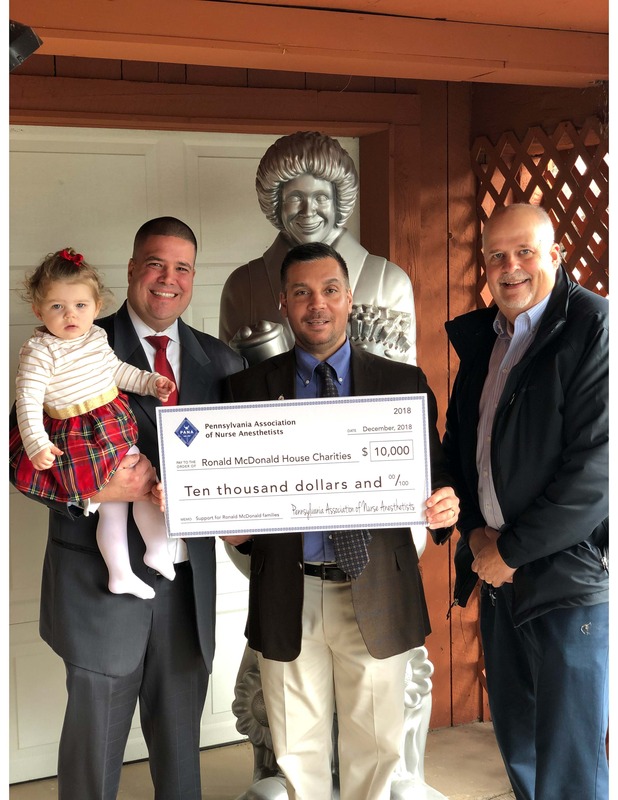 Jason Bauer, MSN, CRNA (left) present a check for $10,000 to the Pennsylvania Ronald McDonald House. PANA supported accommodations for families in need throughout the Commonwealth. Juliann Weiss, SRNA (FJTSA Class of 2017) ‘hands off’ a check for $1,000 to Mr. Lawrence Jacobson, Director of Ronald McDonald House Leadership Giving. In addition to providing dinner, students also donated funds which will provide two months of RMH accommodations for a family in need. Dinner is served! Students from the Frank J. Tornetta School of Anesthesia at Einstein Medical Center Montgomery/La Salle University School of Nursing provided dinner to over 100 patients and family members on Wednesday, January 25th, 2017 as their community service project celebrating Nurse Anesthesia Week. PANA is in below-ground Philadelphia! We now have ads on digital billboards at the Ninth/Locust Station and the Jefferson Station. 10 first year students from Drexel University Nurse Anesthesia program who volunteered to serve lunch for homeless men at St John’s Hospice in Philadelphia. The students volunteered in conjunction with National CRNA Week. Jefferson SRNAs collected a total of 760 pounds of canned food benefiting Philabundance! Villanova/Crozer nurse anesthesia program's CRNA week canned food drive with other Philadelphia programs. Wednesday evening, January 27th, 2016 students and faculty of the Frank J. Tornetta School of Anesthesia at Einstein Medical Center Montgomery celebrated Nurse Anesthesia Week (January 24 – 30, 2016) by reaching out to the community and preparing and serving over 100 dinners to family members and outpatients staying at the Ronald McDonald House located at 39th and Chestnut Streets. The Philadelphia Ronald McDonald House supports families of seriously ill children by creating a community of comfort and hope. The members of the Pennsylvania Association of Nurse Anesthetists are committed to helping their local communities. Here are some of the activities that PANA members have participated in over the past year. 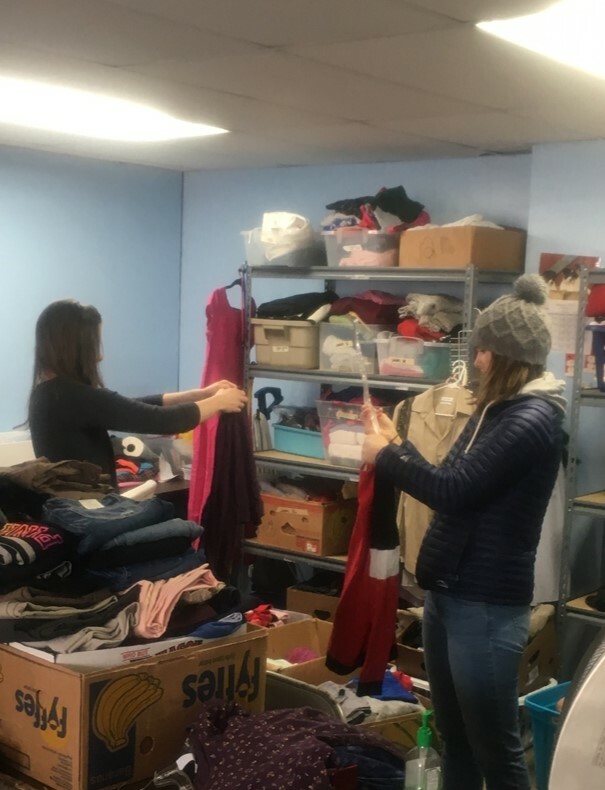 On Wednesday, February 11, 2015, students and faculty of the Frank J. Tornetta School of Anesthesia at Einstein Medical Center Montgomery participated in their annual community service project. This year as part of their community service pledge, students and faculty prepared and served over 100 dinners to family members and outpatients staying at the Ronald McDonald House. The Philadelphia Ronald McDonald House supports families of seriously ill children by creating a community of comfort and hope. 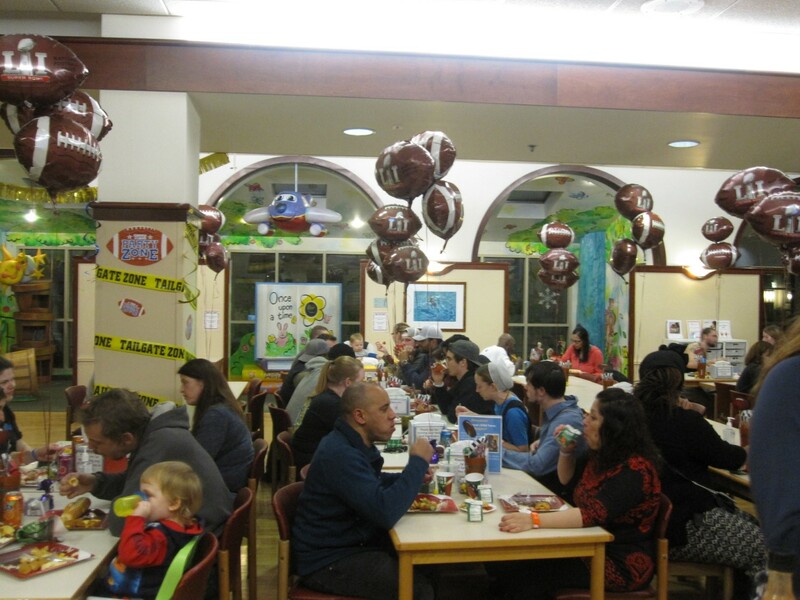 This year families enjoyed a full dinner menu including, Roast Turkey, Stuffing, Mashed Potatoes, Sweet Potato Casserole, Green Bean Casserole, Mixed Vegetables, Salad, Rolls, Cranberry Sauce, Cake, Fruit Salad and Girl Scout Cookies. Students participated in a Thanksgiving Food Drive at the Valley View housing in South Scranton. The program was affiliated with Feed-a-Friend & the United Neighborhood Centers. The students helped prepare thanksgiving baskets for this event. (From Left to Right) First row: Kathleen Emanuel, Lori Bashinsky and Jenna Simonetti. Second row: Bridget Bedford and Sister Maria Regina Loures from Immaculate Heart of Mary. Third row: Nicole Waith and Karen Casselbury. In celebration of National CRNA Week, the anesthesia students and faculty at the University of Scranton participated in a national service project known as the Jared Box Project. The Jared Box Project was started in 2001 in honor of a young boy with cancer who demonstrated strength and courage. Jared would attend his chemo treatments with a backpack full of activities and wondered why other children receiving treatments didn't have the same. Scranton nursing anesthesia students collected supplies and assembled over seventy boxes filled with crayons, coloring books, markers, paint, and countless other activities to be distributed to children in the Geisinger Health System's pediatric units, as well as to pediatric patients in the ER and endoscopy suites. Top Right: J.C. Blair Memorial Hospital celebrated National Certified Registered Nurse Anesthetist Week Jan. 19-25. J.C. Blair anesthesia staff includes, front row, from the left, Des Hanlon, certified anesthesia technician; Tonya Brown, CRNA; Carolyn Wright, CRNA; and Antonio Colmenar, M.D. ; second row, Dave Finch, CRNA; Kevin Lee, M.D. ; Dan Bryson, CRNA; and Art Cassot, CRNA. Bottom: In honor of National CRNA Week, the CRNAs from UPMC Shadyside provided dinner for families staying at the Family House. The Family House is a facility where families stay while loved ones are in the hospital. Top Left: Lori Yakish SRNA, sent us pictures from a volunteer effort the SRNAs from St. Joseph's University-Nazareth Hospital program worked over the summer. Helping out at the Old Pine Community Center's soup kitchen in Philadelphia for center city senior citizens looked to be fulfilling and tiring! Top Right: Christine Allen-Sanders CRNA, sent us a picture of food collected by the Pittsburgh VA hospital CRNAs and donated to charity. Bottom: Drexel University faculty and students collected food and supplies to help victims of hurricane Sandy. Top: Cristine Allen-Sanders CRNA, the PANA's representative in Washington, sends us photos from the AANA Mid Year Assembly and visitation to DC Representatives and Senators. Christine and a dedicated few CRNAs and SRNAs toured Pennsylvania's legislators and shared our goals for CRNA practice. Bottom: PANA Past President Arlene Loeffler attending fundraiser for Congressman Mike Doyle.